Great grandmother, Jessie Susan Harris (left), and sister in law (?) Alice Margaret Wright. Photo by Eden George, Christchurch. From photograph album owned by Jack Thomas Frederick Baker, son of Clara Elizabeth Harris (1873-1945). With grateful thanks to Belinda Lansley for sending me the link to Clara’s album (canterburyphotography.blogspot.co.nz), and others. We can’t help ourselves. We look at family photos and can’t help trying to find some resemblance between those we know and love, and the the faces in pictures. The hallway in my house has become a rogues gallery of family photos and there is much pleasure to be had watching visitors scrutinize them, trying to establish who’s who. My son is regularly mistaken for his father in one photo, and an older cousin in another; while I increasingly see myself in the faces of my maternal aunts. For family historians, photographs are the ultimate treasure. We spend so long trying to put flesh on the bones of our ancestors, that to see the faces of these long-dead men and women is a sweet pleasure indeed. My partner is fortunate to share in a large collection of photos (now digitised) from his mother’s side of the family, but until very recently we had virtually none from his father’s side. Paternal line. Roger Andrew Gray with his parents, Merle Matilda Wright and Wallace Oliver Gray. c. 1956. Photo: Gray-Dove family archive. This changed when a fellow blogger (Belinda Lansley, at Great Grandma’s Wicker Basket) recognised the Big T’s paternal grandmother, Merle Matilda Laura Wright as a friend of her own great grandmother, Dorothy Lord. 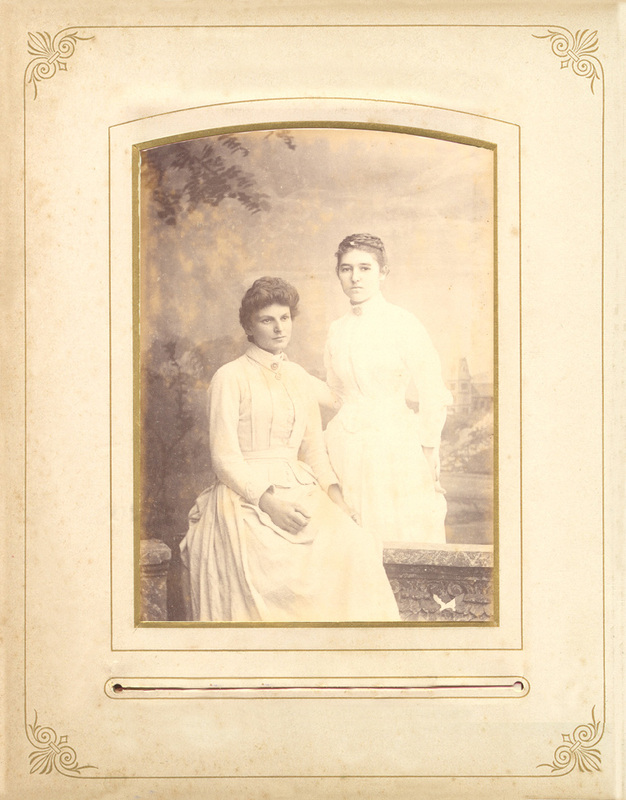 In Belinda’s collection of family photos were several of Merle, her sister Clara and other members of the Wright family. These she generously shared with me. Dorothy Lord, Clara Wright, May Lord, Merle Wright early 1920s. With grateful thanks to Belinda Lansley for allowing me to reproduce this image. 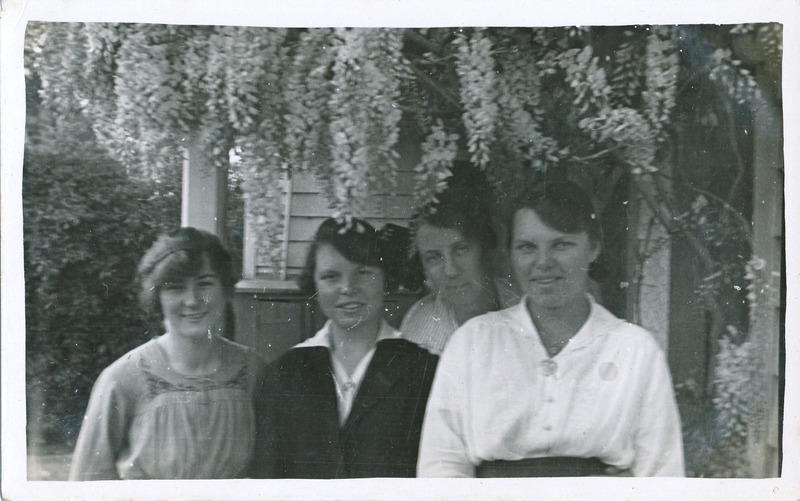 Belinda also sent me the link to a photograph album belonging to another member of Merle’s extended family (Early New Zealand Photographers), and it is through these sources that we have begun to learn a little about this branch of the family. Jessie Harris (shown in the first photo with Alice Margaret Wright) was born on March 21st, 1868, in Christchurch, twin sister of Henry Richard Harris. 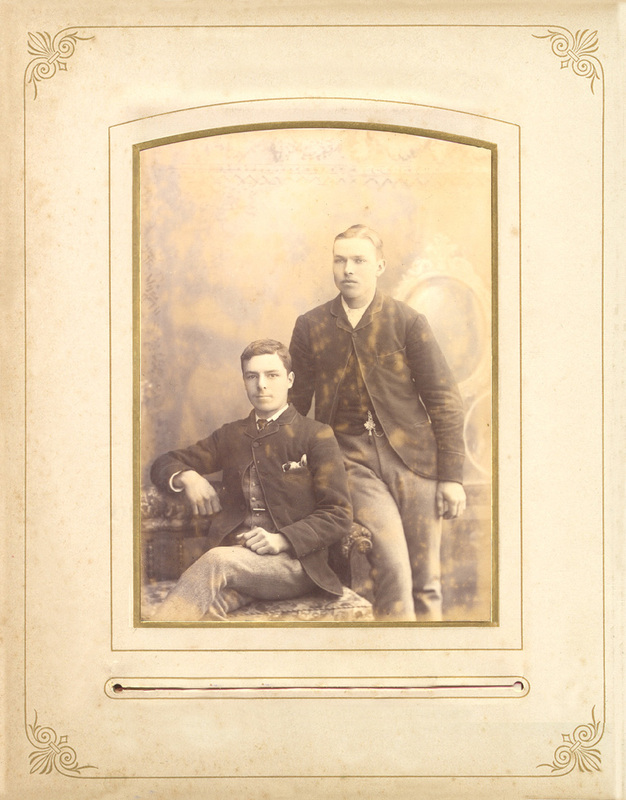 The photo below is Jessie’s brother Henry, with Sidney Wright — Jessie’s husband. It appears that both families lived in Ohoka, a small rural settlement near Christchurch, and would presumably have known each other. Did Jessie marry her twin’s best friend? Henry Richard Harris (left) with Sidney Robert Wright. Photo by Eden George – Christchurch. With grateful thanks to Belinda Lansley for sending me the link to Clara’s album (canterburyphotography.blogspot.co.nz). Sidney was born three weeks after the Harris twins, on 9 April 1868. He was the third of six children born to Robert Marshall Wright and Matilda Ann Baker (married 1859: source BDM New Zealand). 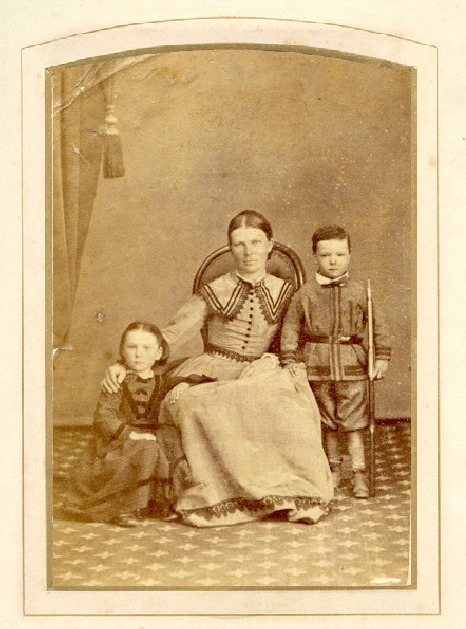 Another photo in the same album shows Jessie and Henry as small children with their mother, Sarah Ann Duffull. A note with the photograph indicates that Sarah was born in Croyden, England. Her marriage, to Nathaniel Harris, took place in New Zealand in 1867. The couple appears to have had 10 children, including two sets of twins (source: BDM, NZ). I haven’t been able to find New Zealand birth records for Nathaniel Harris, Robert Wright or Matilda Baker, so it would appear that all four of Merle Wright’s grandparents were born outside of New Zealand, and immigrated either as children, or young adults, making the Big T a fourth generation Kiwi. Sarah Anne Duffull with her children Jessie Susan and Henry Richard Harris. c. 1871. Photo by Eden George – Christchurch. Grateful thanks to Belinda Lansley for sending me the link to this photo. 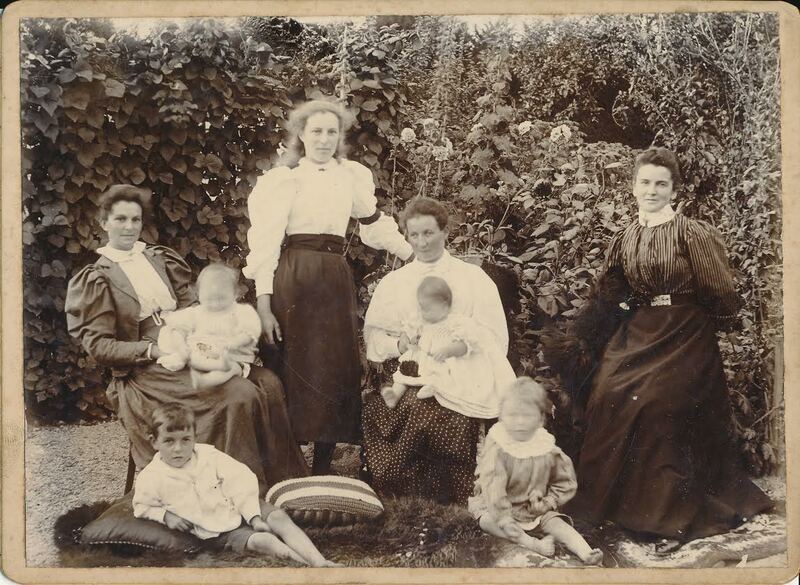 Far left, Jessie Harris, middle seated, May Lord, family friend and great grand aunt of Belinda Lansley, who has kindly shared this photo with me. The identity of the other women and the children is unknown. One of the great joys of genealogy blogging is meeting distant relatives and others with shared connections to the past. When Belinda generously shared photos with me, she gave my family the chance to see the faces of men and women who helped shape the people that my partner and son are today. For that, I am extremely grateful.